I discovered that drum buliding isn't at all intimidating. I've always done my own maintainance, upkeep on my kits. I am mechanically inclined for a "girl" I never had the bucks to have someone else do it, so I learned kit upkeep really quick. A few kits I had as a kid were disasters, so it was a challenge to keep them standing!!! I was hired as a teacher for the house studio and I got to hang out in the builder's bay. I ordered my own kit and got to help out with assembly, wrapping, etc. They were good to me and I learned a lot. Kat - that's cool that you got to help in the assembly process. Yes, I'm familar with Keller shells... my kit was also made with those, but I didn't get to help build it like you!!! That kinda gives you a special appreciation for your drums, huh? Hey.. My names Mikhail and I've been browsing the forum for a while, but just now decided to post. I'm 16 and I've been drumming since I was 10 or so in school band. I didn't start drumming on a set until July 2006. Doing school band helped me tons, since I started set already knowing how to count, hold a decent beat, and read music/tabs. I'm not very good, but I'm trying. 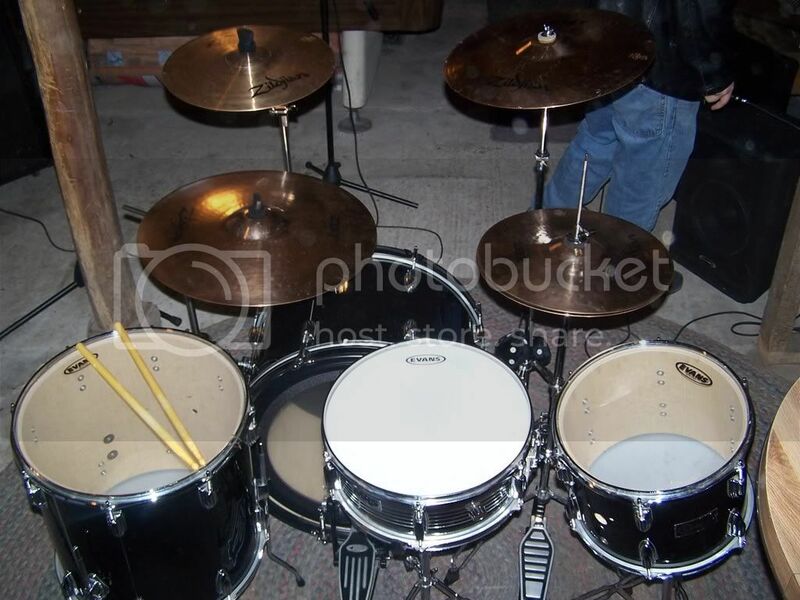 I always wanted to drum on a set, but never had enough money. One day my friend told me his brother was selling his set for $100, so I went and checked it out. It was just a cheap eBay set really, probably $200 or so on eBay if I were to look it up. It included the basics: snare, bass, 2 rack toms, floor tom and a crash/ride and hi-hats. I went for it and bought it and started messing around a bit. My friends decided they wanted to start a punk band, so I joined up with them, and it's been going great. With a few shows we've been playing I managed to do quite a bit with the set. I managed to replace all of the heads with Evans and take out all the cheap-o cymbals and bought a set of name brand cheap-o cymbals, the Zildjian ZBTs. They're not bad.. can't complain for the price. I messed around with my setup a bit and wound up taking out one rack tom and putting the other on a snare stand. I like the setup quite a bit. That's about it.. Probably more than any of you ever needed to know about me, but oh well. You will love being here! Hi! Let me introduce myself. My name is Gabi. I am nine years old, Have a new pair of drumsticks, Always wanted to be a drummer. My mom says I need to get an electronic drum set since where we live we can't have a normal set, but they are expensive so she bought me a pair of drum sticks and told me to practice drumming on everything in the house with them first and then if I still like drumming she'll try to buy me an electronic set. I just wanted to say hello and to ask you what is the best way to start to be a drummer?? Hi Gabi and welcome to Drummer Cafe! Number 1....YOU KEEP DREAMIN!!!! Everything else will work itself out in due time. Electronic kits are expensive and may not make the best beginner kit, although it is difficult if you live in an apartment etc. Make sure to get a good practice pad and find a good teacher. Do you have band at school? At your private lessons and at your school band rehearsal you don't have to worry about how much noise you make! My daughter is 8 and enjoys playing my drums from time to time, although not seriously. We're lucky enough to live in a place where noise isn't really an issue. However, when I was young (about your age) and practicing at home, it was not uncommon for the neighbors to call the police on me! I made it a point to seek those neighbors out and ask them when some appropriate times would be for me to practice. It wasn't ideal, but I was able to work out a reasonable practice schedule (on real drums) that accommodated the neighbors. The rest of my practice time was spent on pads and such, where noise wasn't a factor. Good luck! BTW, you have an extremely mature style of writing for a 9 year old! I'm guessing that you do very well in school! Thank you for the comploment! I really apriciate it. BTW, I don't go to school. I am home schooled. (But I did go to school last year.) Thank you for your kind advice! Everyone is really nice here, especially to newbies. We have several female members and I'm sure they will welcome you with open arms. Don't underestimate the power of being a woman drummer. Okey Dokey, have phun and learn lotz! My name is Sara, I'm 22 and have been playing for a couple years now. I have a LOT to learn and this looks like the place to be. I recently bought a Mapex M Birch studio kit in black forest green and LOVE it. I have a pork pie snare, zildjian, sabian and meinl cymbals, (I'm liking my meinls a lot) and axis pedals. (pics to come someday) My BF (boyfriend) plays guitar and we try to write music together. I also play bass, but drums are my new passion in life. Welp, thanks for reading. Welcome Sara!! You came to the perfect place to learn a lot of great stuff!!! I just discovered this awesome forum and am looking forward to sharing and recieving as much new information as possible. I am 25 years old and live in southern Utah. I am not mormon, And have been playing my 4pc Premier Signia Maple kit for about 13 years. I have played with many local bands and am now trying to get in with the worship team at my church. I thank God everyday for the talent he has blessed me with. Some of my favorite drummers are Stewart Copland, Ryan Rhapsys, Billy Ward, Nathan Richarson, Steve Gadd and Steve Smith. I'm not real big on the double bass, I have a 9002 double pedal but rarley use it. I play a Zildjian set-up consisting of a pair of 14 special dark K hi-hats that I absolutly love, a 18" A custom fast crash, and a 21" sweet ride that I think is the most versitile ride cymbal that Zildjian makes. Anyway if you have actually read all of this, thanks. My name is Austin Case , and I've been taking drum lessons from Todd Norris, A.K.A:Drums4jc, for about three years now. I just turned 13 a week ago.I couldn't ask for a better instrument to play and I'd like to hear from you guys! Hey there my name is Nathan and i'm from Louisiana. I'm 46yoa and having been playing drums on and off since i was 10. Currently i'm playing in a southern gospel group that plays around at different churchs. Last year i purchased a nesting kit from the Modern Drum Shop and they are very nice. The sound is very good for such a small kit. Just found the cafe a couple of weeks ago. I did not know such a place as this existed on the internet. Very nice. There is a lot of good info here. Welcome Vick, check in often as you can, theres really a lot to offer here and hopefully some of your advise/stories/pics, etc. will be some of those features for the rest of us as well as new members down the line. well, im not exactly nneewwww, but i added new pic, slogan, and signature! does that count??? Well I've been posting here for a few days I guess, but didn't see this thread 'till now, so heya everybody. I'm really enjoying these boards - you all have put together a really cool community. I hope my contributions will be helpful. Hi, Austin. Welcome to the forum! I hope you have a good time here. Every time I go to Sam Ash, I always want to play the drums, next to the guitars and pianos. Well, you come to the right place. BTW, Happy birthday. Hi, Nathan. Welcome to the forum!